An old post, so ignore the reference to the end of the world (this particular ending was 21 May 2011; the post dates from 20 May that year). Obviously, we’re still here. 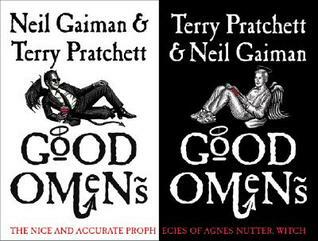 Good Omens: The Nice and Accurate Prophecies of Agnes Nutter, Witch (1990), Neil Gaiman and Terry Pratchett, 369 pp. With the world so publicly about to end, this seemed the appropriate read for this week. It certainly made me feel a bit better about impending Armageddon. Whenever the news reports and interviews got to be overwhelming, I could turn to this romp through the end days and feel much better about it all. The plot is complex, a combination of babies switched at birth (reminding me of Mark Twain’s Pudd’nhead Wilson and its take on the nature vs nurture argument), good and bad angels (see Dogma for an even more disturbingly funny version of this ongoing battle), Ursula K. Le Guin’s The Lathe of Heaven (whose main character can alter reality via his dreams), and Yeats’ “The Second Coming“. Here’s a stab at the plot: Aziraphale and Crowley — angel and demon, although all demons are fallen angels, so perhaps just angels |:) and >:) — are in charge of organizing things for the Anti-Christ, who at age eleven is supposed to be ready to lead the demons against the armies of heaven. The only problem is that, during the shell game that should have replaced a diplomat’s newborn son with the Anti-Christ, things got a bit mixed up, and Satan’s child ended up with a nondescript family. And here we are, with the four riders of the Apocalypse setting out on their final errand, and the diplomat’s son, Warlock, is showing no signs of evil. Where’s the real Anti-Christ? Well, we know, but none of the characters do, so part of the joy is in watching them scramble to get to the right person in time to be part of, or to stop, Armageddon. There are also four children (doppelgangers of the Four Riders), a witch, a couple of witch finders, and untold others, swirling towards each other and a final cataclysm of mad hilarity. Hell wasn’t a major reservoir of evil, any more than Heaven … was a fountain of goodness; they were just sides in the great cosmic chess game. Where you found the real McCoy, the real grace and the real heart-stopping evil, was right inside the human mind. “Ineffable” appears frequently in this book. The End Days may be part of God’s Great Plan, but averting The End Days might also be part of the Plan — there’s no way to predict or know in advance. Since we can’t understand the ineffable, what are we to do? Pratchett and Gaiman weave all these threads together into a beautiful, seamless piece of work. But if the book isn’t enough to calm your nerves in these heady times, pull out the Clash’s London is Calling LP and listen to “Armagideon Time“. That should cheer up anyone who’s been left behind. This entry was posted in Fantasy and tagged Neil Gaiman, Terry Pratchett. Bookmark the permalink. 2 Responses to Bang? Whimper? Something else? Very entertaining review that gets to the nub of the plot: if God is ineffable how can we second guess what his plan is? Exactly! So just crank up the volume, dance around your house, and hope the sun comes up tomorrow (chances are it will).